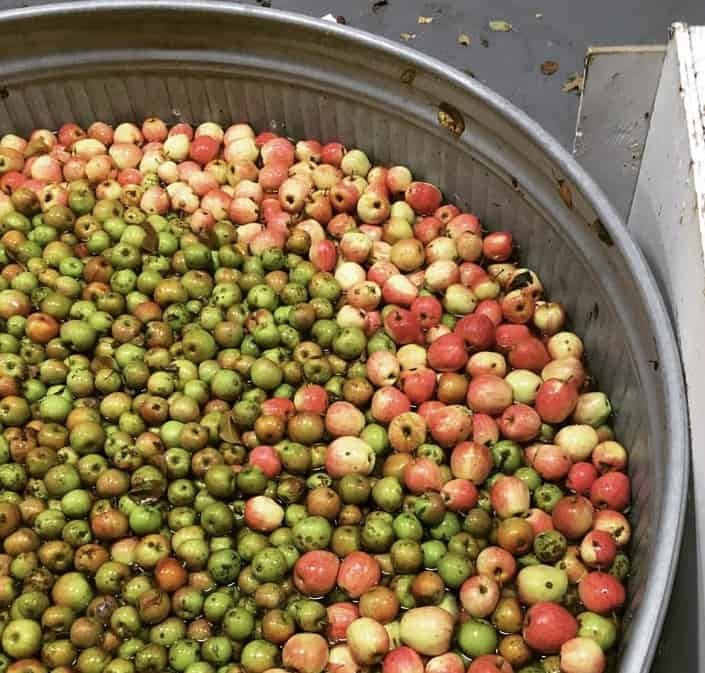 It’s back: Portland Cider Co. is kicking off its 3rd-Annual PDX Apple Recycling program, saving literally tons of apples from a rotten fate and turning them, instead, into delicious cider! Portland-area residents are encouraged to bring in their edible-quality backyard apples (minimum donation of one bushel — that’s 40 pounds — please!) any day between 9 a.m. and 9 p.m. from now through October 31. All varietals are welcome, but crabapples, bitter sharps, bittersweets and bitters will earn you extra swag. Ready to pitch in? Apples can be dropped off at the Clackamas Taproom and Cidery, located at 8925 SE Jannsen Rd., Bldg. F, in Clackamas, Oregon. 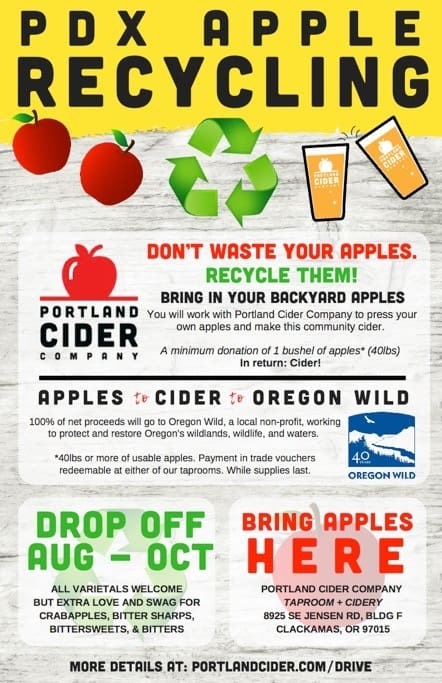 All of the apples donated will be “recycled” in the best way possible: pressed into a community cider to support Oregon Wild, a nonprofit conservation organization that works to protect and restore Oregon’s wildlands, wildlife and waters as an enduring legacy for all Oregonians. The finished “Oregon Wild” cider will be released in December at Portland Cider Co.’s annual Wassail Party. All of the net proceeds of that cider’s sales will be donated to Oregon Wild’s Oregon Brewshed Alliance, an outreach initiative made up of a coalition of brewers and cider makers that work to protect the public and wildlands in the Northwest. Find Portland Cider Co. at 3638 SE Hawthorne Blvd. in Portland, OR; phone: (503) 206-6283; and 8925 SE Jannsen Rd., Bldg. F in Clackamas, OR; phone: (503) 908-7654.